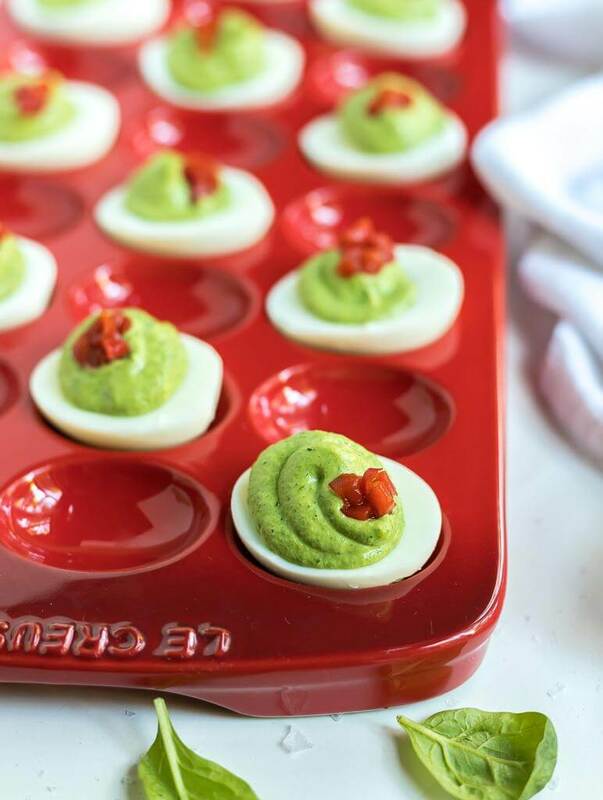 This Holiday Deviled Egg Recipe will be the star of your Thanksgiving or Christmas Dinner. 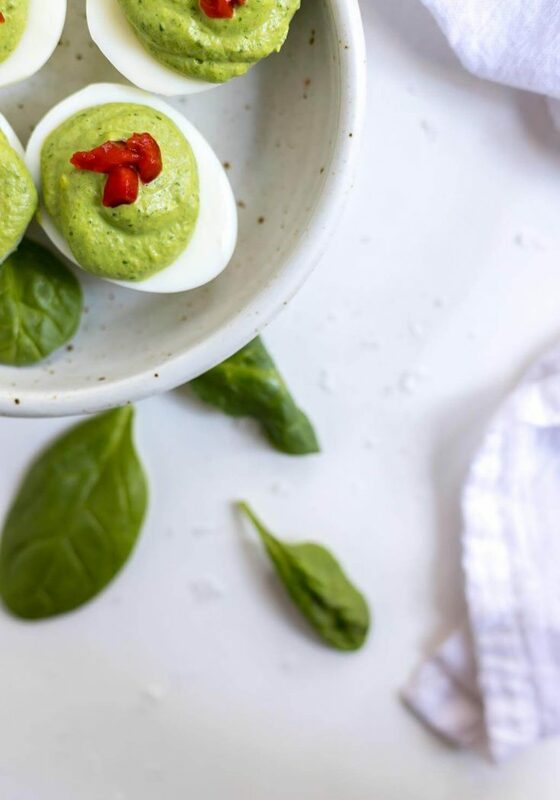 The bright green deviled egg filling is all natural thanks to fresh baby spinach. 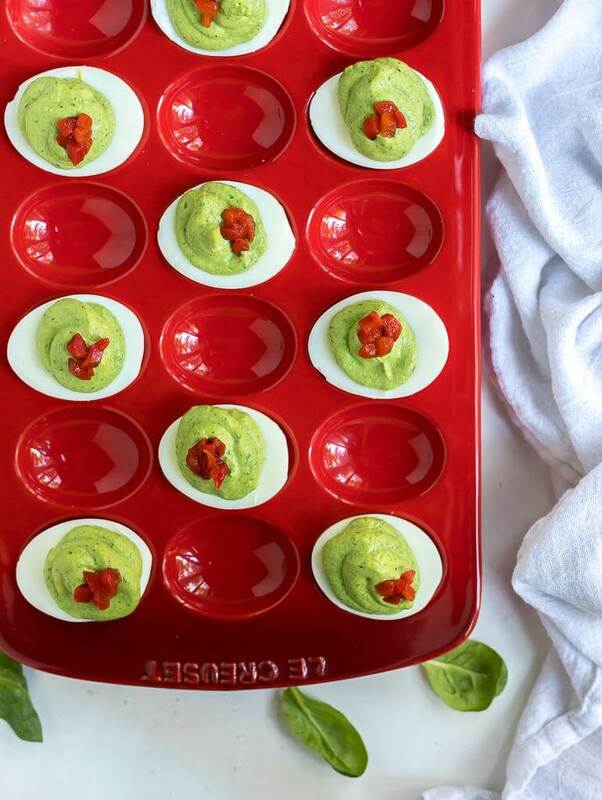 The red pimentos give these eggs a pop of holiday cheer. This appetizer is fun, festive and nutritious. 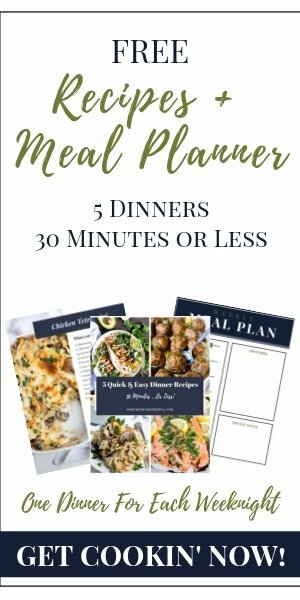 This recipe is Whole 30, Paleo, Keto, Dairy Free, Gluten Free and Low Carb. 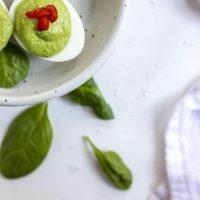 Homemade Deviled Eggs are one of those super easy appetizers that can be flavored in so many ways. That is why deviled eggs are one of my favorite holiday recipes. 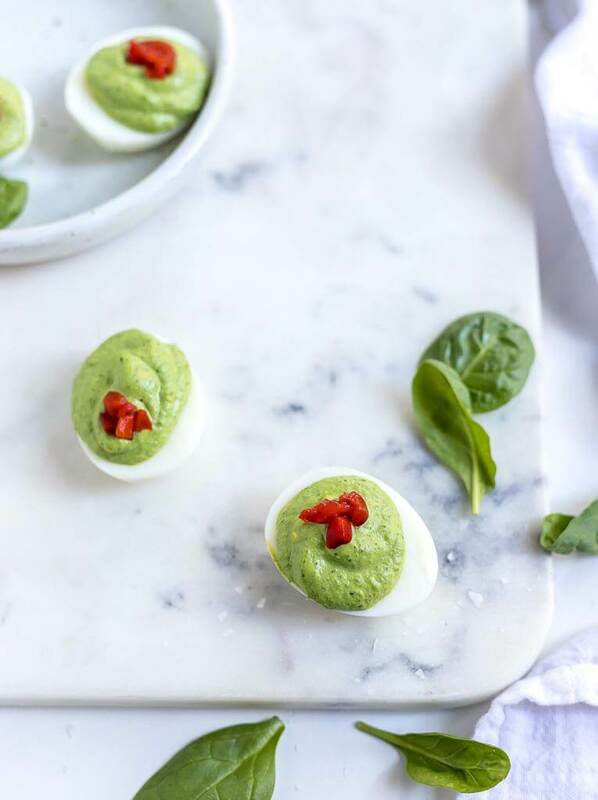 This Holiday Deviled Egg Recipe is just as simple as basic deviled eggs with the addition of spinach to color the filling green. All you need to do is hard boil your eggs, peel then slice lengthwise. Blend up the yolks, mayo, mustard and fresh spinach. Fill the egg whites then top them with pimentos. Enjoy your festive holiday eggs! How Long Do You Boil Eggs For Deviled Eggs? Everyone has their preferred way to boil eggs. My preferred method is below. I use the Martha Stewart Hard Boiled Egg Method . . . minus 2 minutes. Place eggs in a 3 quart pot filled with cold water. Bring the water to a boil, cover, remove from heat and let sit for 10 minutes. Run eggs under cold water until fully chilled. Refrigerate 2+ hours before peeling. Peel boiled eggs. Slice in half, lengthwise. Transfer yolks to food processor or jar. Discard two egg whites leaving 12 deviled eggs total. Add spinach, mayo and mustard to yolks. Process or use handheld blender (my preferred method) until mixture is smooth. Start with 3 TB mayo then add more if needed. Salt and pepper to taste. Transfer yolk mixture to ziplock bag. Cut the bottom corner off of bag and pipe filling into egg whites. Top each egg with 4-5 diced pimentos.